For a long time, the only way to know about Portillo’s was to be from the greater Chicagoland area, or to have passed through there and had a local acquaintance demand that you go to this one specific hot dog stand, not to be confused with the many, many other hot dog stands in the immediate vicinity. While still a primarily Midwestern phenomenon (Illinois in particular), you can now also dine on Portillo’s famous char-broiled burgers, Chicago-style hot dogs, and Italian beefs from California and Arizona to east in Florida. And if you’re near a Portillo’s this Tuesday, April 9th, you’ll get to sample one of its best and most revered menu items for only 56 cents on Portillo’s 56th birthday. If you’ve ever heard about Portillo’s, it’s likely you’ve heard about the Famous Chocolate Cake. What?! Chocolate cake at a hot dog stand? But as a Chicagoan writing for a food site, let me assure you that the Portillo’s chocolate cake is one of our greatest culinary export. Really, it should be more famous than our sausage-cheese casserole. Take your standard chocolate cake. Now imagine a sponge that’s simultaneously heavier and fluffier. Then plaster on two pounds of chocolate frosting. Imagine the richness and sweetness of several hundred cubic tons of chocolate condensed to a cake the diameter of an LP record. Imagine a cake that contains 8,616 calories. It is good eating, indeed. 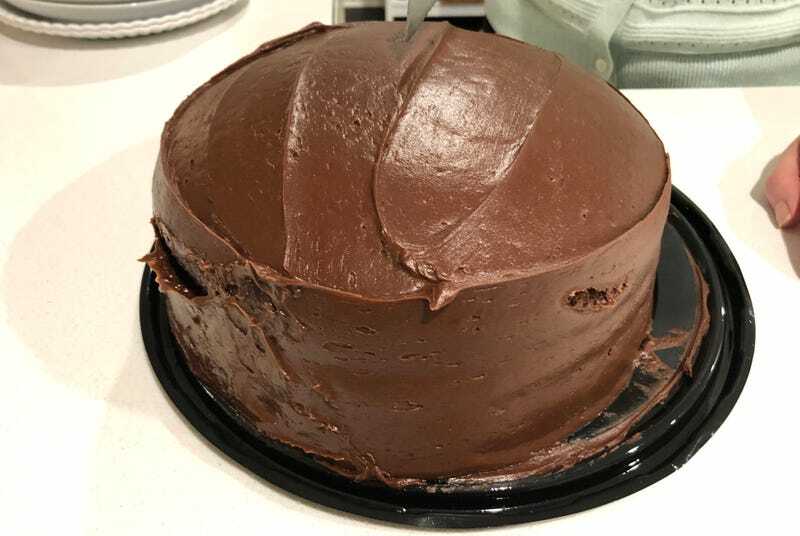 That a slice of chocolate cake so thick it could constitute its own meal is capable of bringing us all together and offering a reminder of the zeniths that human collaboration and ingenuity can reach. Oh, their chocolate cake shake is pretty great as well. We’re normally loathed to play stenographer to corporate press releases, but that this proud Chicago creation costs just 56 cents a slice (with purchase of another menu item, which, fine) passes our sniff test. We at The Takeout believe your life will become tangibly more enjoyable by sampling one. Sure, you can try to recreate it at home; a summary scan of online recipes suggests that it’s doable as long as you’re not averse to mayonnaise. But it won’t be Chicago’s most famous chocolate cake; the chocolate cake, as far as we’re concerned.